Lucky me had the opportunity for a quick encore visit for a working lunch, I had planned a visit to Cafe Vue, but alas, standing room only meant a short walk to the Bistro. 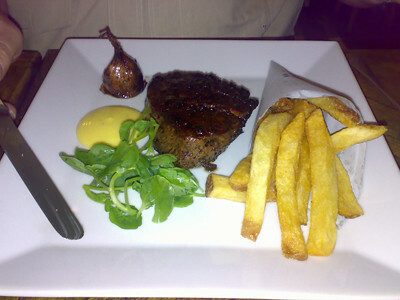 My colleague greatly enjoyed his eye fillet of grass fed beef with Bearnaise sauce and those infamous Pommes Frites. 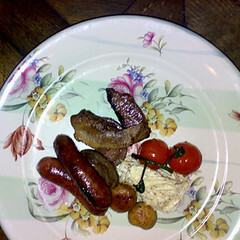 While I had the Plat Du Jour, a Mixed grill d'agneau being a Wednesday. This consisted of a couple of scallops, probably Canadian, a spicy sausage, a non-spicy sausage, a whole kidney halved, some baby tomatoes on the vine, a slice of roast lamb and piece of grilled fillet. This was served with a green salad and mound of coleslaw with an excellent mayonnaise. Unfortunately no time for another of those, out of this world's, Tart Tatin. (At least that's what I'm telling Haalo). Did have time for a very nice Cafe Latte at Cafe Vue which uses our coffee of choice, Illy. Would that include the tip?